The recent IndoDefence 2018 held in Jakarta from November 7 until 10 served as a showcase for the country’s growing catalog of military products. 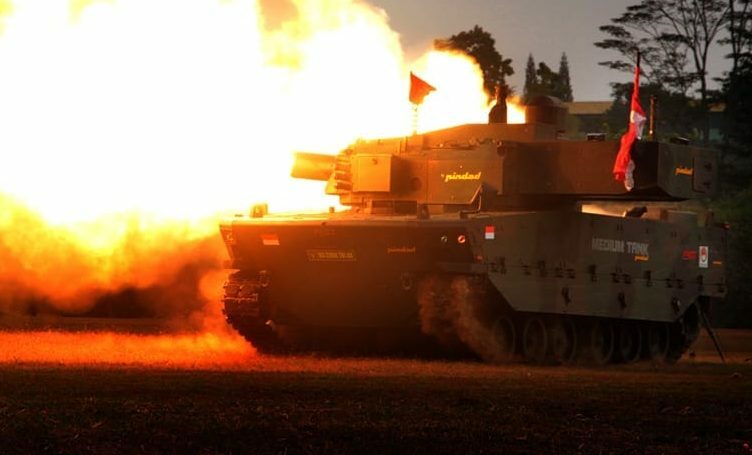 Foremost among the land systems that appeared at the four-day event was the “Harimau,” the name bestowed to the medium tank produced by a joint venture between state-owned manufacturer PT Pindad and FNSS from Turkey. Rather than a locally designed tank, the Harimau is an amalgamation of parts from several sources. So bullish is PT Pindad’s management on the Harimau’s prospects, however, they’re convinced the Philippine Army might want to buy it too. Like other light tanks offered by Western European manufacturers, the Harimau is based on an APC–the FNSS Kaplan–but redesigned to fit a Cockerill turret made by Belgium’s CMI Defence. Weighing half the gross tonnage of a third-generation main battle tank, the Harimau is armed with a 105mm gun fed by a bustle mounted autoloader. This leaves it with a crew of three who are all seated in the hull. The Harimau, or Kaplan MT in its past life, isn’t equipped with propellers but is tall enough for wading across shallow bodies of water. Indonesia’s TNI are meant to be the first customers of the Harimau whose role will replace the army’s aging British-made Scorpion and French-made AMX-13 light tanks. Once production starts in 2019 the Harimaus are intended to complement the heavier Leopard 2 MBTs bought from Germany’s surplus stocks in 2013. During IndoDefence 2018, PT Pindad’s chief executive claimed the output for its medium tank can reach 80 units a year. If this is accurate, then the TNI may be planning to field more than 200 Harimaus by 2025. The Harimau is a worthy opponent to second and third-generation tanks. The 105mm variant of the low recoil Cockerill XC-8 is augmented by a fire control system with day/night sights and can defeat targets four kilometers away. (Depending on the ammunition used though.) Its turret also comes with a 7.62mm coaxial machine gun and a panoramic sight. These features give the Harimau an edge against older Chinese and Soviet T-series tanks that are still used by other Southeast Asian militaries. Since Indonesia’s state-owned companies are keen on exports the Philippines is deemed a convenient market for its size and proximity. The Armed Forces of the Philippine (AFP) have become staunch patrons of Indonesia’s military products–from landing platform docks to fixed wing transport aircraft–ever since their budget for acquisitions was raised several years ago. 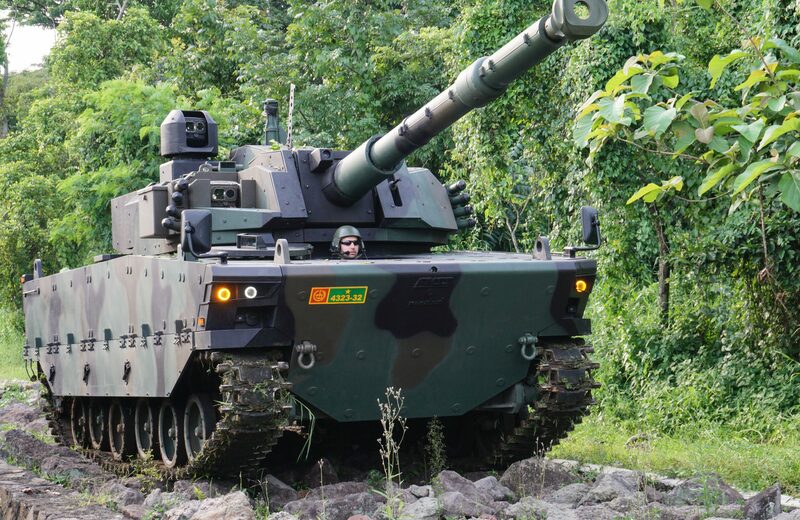 Now that the Philippine Army (PA) are indeed studying their options for a suitable light/medium tank, being a tracked vehicle with at least a 105mm main armament, the Harimau looks poised to grab lots of attention. But if PT Pindad thinks the Harimau can clinch the tender for at least a battalion of medium tanks (more or less 50 units) there’s enough regional competition to prolong the struggle. Foremost is South Korea’s Hanhwa with its K21-105, which has the same turret as the Harimau, and it’s possible even Singapore’s ST Kinetics offers its own tank based on the NGAFV, again with the same Cockerill turret. One far-fetched outcome that may spoil the whole effort is if the PA changes the requirements to accommodate a wheeled “fire support vehicle” equipped with a large caliber gun. This is bound to dash PT Pindad’s hopes unless it can push its own 6×6 Badak that boasts a 90mm gun. 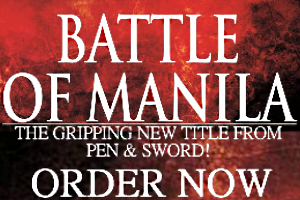 But military procurement is often unpredictable and only time will tell whether the Philippine Army does buy medium tanks or allows the whole program to languish.